One area where the calorie is used is in nutrition. Energy contents of foods are often expressed in calories. However, the calorie unit used for foods is actually the kilocalorie (kcal). Most foods indicate this by spelling the word with a capital C—Calorie. Figure 7.1 “Calories on Food Labels” shows one example. So be careful counting calories when you eat! 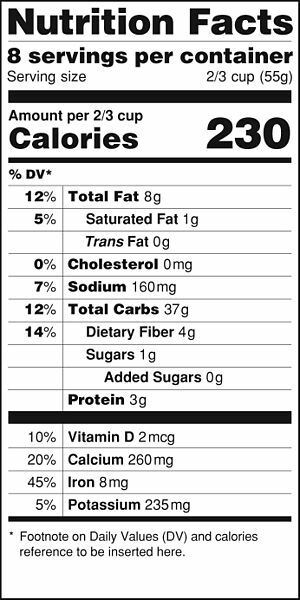 Source: “FDA Nutrition Facts Label 2014′′ by U.S. Food and Drug Administration is in the public domain. The label in Figure 7.1 “Calories on Food Labels” states that the serving has 38 Cal. How many joules is this? Energy by Jessie A. Key is licensed under a Creative Commons Attribution-NonCommercial-ShareAlike 4.0 International License, except where otherwise noted.